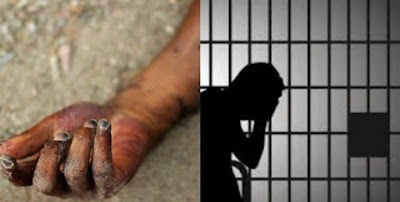 A man identified as Henry Anaele was remanded by a Ebute Meta trial court for beating his wife to death because of a N200 gift she had received from an individual. The Chief Magistrate, O.O. Olatunji, said the accused should be returned to Ikoyi Prison pending the opinion of the Director of Public Prosecutions (DPP). Mr. Anaele, 40, whose plea was unsuccessful, was charged with murder. Mr. Adams stated that the accused had discovered that someone had given his wife - Chinyere, 35, the amount of N200, which did not suit him. And when questioning him, he said that she could not give any tangible answer as to why she would accept the donor's money. "It angered the accused who beat his wife to death for collecting the money, tried to escape but was apprehended by neighbors and then handed over to the police," he said. said. The offense violated Article 223 of the 2015 Lagos Penal Law, which stipulates a death sentence for offenders. The magistrate adjourned the case until 6 August.